Indigenous ranger programs are a rare good news story of a government initiative that delivers outstanding social, economic, cultural and environmental outcomes. Now, new data have revealed that many Queenslanders would like to see these programs expanded. Recent polling shows that 80% of Queenslanders, including 70% of One Nation voters, support Indigenous land and sea management, while 88% of Queenslanders support a proposal to create 200 new ranger jobs over the next ten years. The 2017 Queensland budget pledged 25 new Indigenous ranger jobs over the next three years. That would bring the total number of state government-supported ranger positions to 101. As our research below shows, there should be much more support to bring Queensland Indigenous ranger numbers into line with other big states. Aboriginal and Torres Strait Islander communities see these programs as a cornerstone of cultural maintenance and management of their ancestral estates. There is a strong case for the program to be dramatically expanded in Queensland and beyond. Why do Queenslanders support more Indigenous ranger jobs? Indigenous Natural Cultural Resource Management (NCRM) organisations and ranger groups perform many tasks. These include management of heritage sites, surveillance, monitoring and management of wildlife, fire management, feral animal control, weed control and recording of Indigenous ecological and cultural knowledge. Local communities, and even the United Nations, have widely acknowledged the benefits of Indigenous ranger programs. For us, it’s about meaningful employment for our young people including training and opportunities to develop a career. The program not only benefits the individual but is significant for their families and the wider community. Benefits are not only employment but also physical, mental and spiritual health, and pride in our culture and country. We need rangers on country as our country has been under assault since colonial times. Impacts include mining, cattle and weeds, which then impacts on our flora and fauna. Our strong and diverse presence on country presents an opportunity to work with Indigenous biocultural knowledge systems and Western science. Participants for the ‘Skills on Country – Cultural Mapping Workshops for Young Traditional Owners’ project on Mbarbaram Country. Funded by the Queensland Indigenous Land and Sea Ranger program. A 2015 Australian government review quantified the benefits of the national Indigenous ranger program. Using the Social Return on Investment methodology, the review found that an investment of A$35.2 million from government and a range of third parties between 2009 and 2015 generated A$96.5 million in social, economic, cultural and environmental returns. That’s nearly a threefold return on investment. …effectively overcoming barriers to addressing Indigenous disadvantage and engaging Indigenous Australians on country in meaningful employment to achieve large-scale conservation outcomes, thus aligning the interests of Indigenous Australians and the broader community. Planning for the Future on Mbabaram Country. 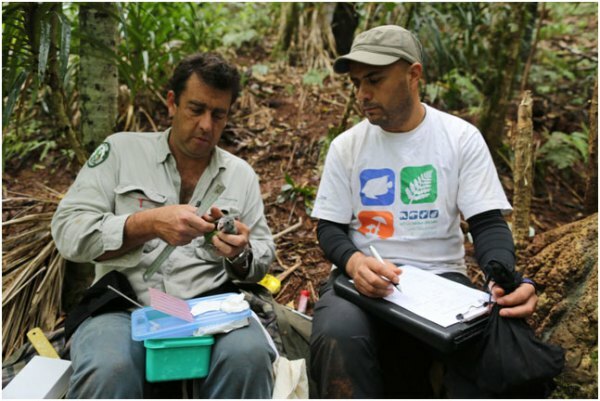 The Indigenous ranger community-based initiative has grown to produce many well-established organisations with expertise in knowledge integration, planning, geographical information systems (GIS), research, training and management. In 2017, both the Australian government’s Indigenous ranger program, Working on Country, and Queensland’s Indigenous Land and Sea Ranger program celebrated their 10th anniversaries. Indigenous rangers are also funded through other avenues such as non-government organisations, national parks and other supporting institutions. The Working on Country program supports 109 ranger groups and 777 full-time equivalent ranger positions across Australia. The map below shows the breakdown of state and territory funded positions in 2014-15. It highlights that the Queensland Indigenous ranger workforce is substantially smaller than those of Western Australia and the Northern Territory. Queensland rangers make up only about 8% of the Working on Country program. Queensland Indigenous Protected Areas make up less then 6% of Australia’s government-funded Indigenous conservation estate. However, Queensland is Australia’s second-largest state or territory, covering 22.5% of the country. According to the 2016 census, 29% of Australia’s Aboriginal and Torres Strait Islander people live in Queensland, most of them in the central, south and southeast of the state. The disproportionately low allocation of Indigenous ranger positions and Indigenous Protected Areas in Queensland relative to its size and Indigenous population warrants attention at the national level. Aboriginal and Torres Strait Islander people in Queensland are not receiving support for Indigenous rangers to match the size of the state and Indigenous population. Most Queensland Indigenous ranger jobs are offered in the remote north of the state and southeast. Our research reveals large gaps in documented Indigenous biocultural knowledge in southwest and central Queensland, where many Aboriginal people live. This points to the need for enhanced biocultural resource maintenance and possibly revival, which expansion of the ranger program in this region could achieve. The Queensland government has called for donors to support the Indigenous Land and Sea Ranger program. Considering the outstanding environmental, economic and social benefits of Indigenous rangers and their overwhelming support by Queenslanders, more could be done in-house. The Queensland government pledge to add 25 ranger positions, for a total of 101, should be increased fivefold. This would reflect the geographic, cultural and environmental challenges the state faces. While the Indigenous ranger support by the state and federal governments to date is to be commended, the Queensland community clearly has an appetite to expand and enhance the Queensland program. 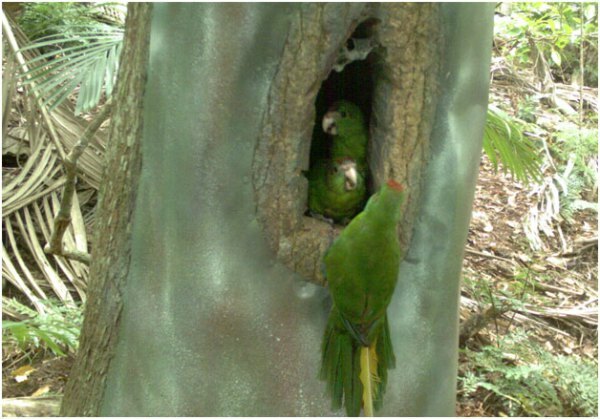 Two trials of green parrot fostering have been very succesful in Norfolk Island National Park. Last year we found a nest of five chicks with two very small females failing to thrive because their older and much bigger brothers were getting most of the food. We decided to try a fostering program, and moved the two larger males to another active nest site – where they would be cared for by another pair of green parrots. The male at the new site quickly adopted the two chicks, and all the chicks in the nest fledged successfully. And it gave the female chicks in the original nest a much greater chance of survival. The link below is to a media release concerning park closures in Myall Lakes National Park and Booti Booti National Park, due to the annual Bitou Bush control aerial spraying program. The link below is to an article reporting on the good news story of the Madagascar Pochard (Aythya innotata) duck, which until recently was thought to be extinct. Now a captive breeding program has increased the population by almost 50% in one season. An investigation into possible fox populations in Tasmania has concluded that there are indeed foxes in Tasmania. It is thought that the fox population is currently small, yet the fact that the fox has now reached Tasmania is a major cause for concern. Some 24 plus native species will come under immediate pressure due to the fox now being active throughout the state. Evidence is now overwhelming that foxes are in Tasmania. An eradication program will continue in its attempt to remove the growing fox problem in Tasmania.